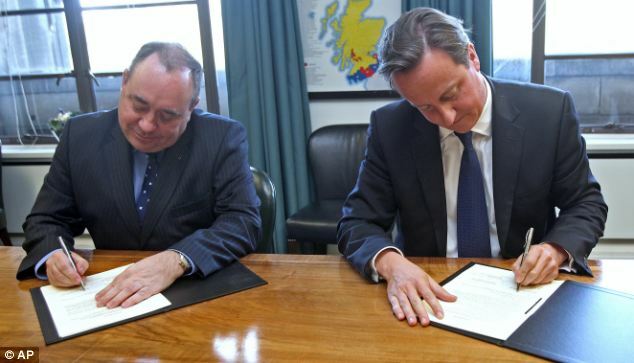 So the deed has been done and David Cameron has signed the independence vote deal, known as the “Edinburgh Agreement”. But while all the polls say that by two to one, Scots do not believe the country would be more economically successful on its own, making a ‘no’ vote all but certain in the autumn of 2014, I can’t help but worry that common sense will fly out of the window come 2014. The Nationalists will jump on the bandwagon of the significance of the date – 2014 marks the 700th anniversary of The Battle of Bannockburn (the first Scottish War of Independence when Scotland scored a decisive victory over Edward and the English), and there is also the fact that the Commonwealth Games are being held in Glasgow just before the crucial vote. Alex Salmond has got his own way on 2 counts – the date of the referendum (Cameron had wanted it to take place next year) and also on allowing 16 and 17 year olds to vote. David Cameron did however win on one key point. Voters will be asked a single question – whether they want in or out of the United Kingdom – despite Mr Salmond’s desire for a second option of increased powers for Holyrood, “devo-max”. I find it hard to believe that any right-minded individual could believe that Scotland would be better off as an independent nation. The economic figures speak for themselves but the SNP also seem to have failed to understand one other crucial matter. Mr Salmond claims an independent Scotland could simply remain in the EU and keep Sterling. Constitutional experts and the Westminster government say, however, that Scotland would have to reapply to the EU for membership and commit – like all new EU members – to joining the ill-fated euro. A recipe for disaster? I think so! As an English person who has been living in Scotland for the past 16 years, I truly believe that most voters are too sensible to vote Yes, especially in these disastrous economic times – it would not be Scotland the Brave, but Scotland the Foolhardy! If the disaster that is Scottish Independence does happen – I’ll be on the first flight out of here! Posted on October 16, 2012, in Edinburgh, Glasgow, Glasgow2014, Politics and tagged 2014, 700th anniversary, Alex Salmond, Battle of Bannockburn, David Cameron, devo-max, Edinburgh Agreement, EU, Euro, foolhardy, Glasgow2014, Holyrood, Scotland the Brave, Scottish Independence, SNP, Sterling, United Kingdom, Westminster. Bookmark the permalink. Leave a comment.